Every child is a bit picky about their eating habits. You have to cook stories of dinosaurs or ghosts just to make them include green leafy vegetables on their plates. Creating an environment for your kid where he could develop a positive relationship with nutrition is one of the primary steps that you need to take just to ensure the health of your child. If you want your kid to develop good eating habits, try to be persistent. Keep one thing in mind, that there is a fine line between being pushy and being persistent. Try not to be aggressive and pushy about it. You can reduce the sugar-sweetened drinks as well as salt in your lad’s diet. There are also some simple ways through which you can minimize the intake of fatty food. Some of them may include whole grain bread, healthy snacks such as veggies and fruits, low-fat dairy products etc. 1. Do not place restrictions on food: It’s a common child tendency that if they are asked not to do something, they do it more. Also, putting restrictions on food may develop some eating disorders like anorexia or bulimia anorexia which can have a negative impact on your kid’s health. According to the nutritionists, instead of banning food from your child’s lives, it’s better to present it in some interesting way, that they might find fascinating. 2. 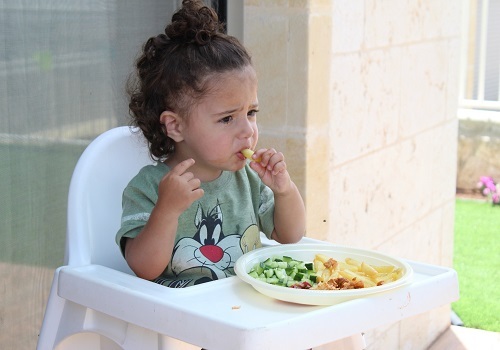 Encourage your child to eat steadily: When a child eats, he/she can detect the hunger as well as fullness completely. So, before serving for the second time, first ask him to wait for sometime and then tell whether he is still hungry or not. That waiting time period will give the brain to decide about the fullness or hunger. 3. Make your mornings count: Breakfast is the most important meal of the day. Most families do not eat enough fibers in their first meal of the day. It is important to include high-fiber cereals in your day to day diet. Other than that, including healthy food items in your diet, also has long-term health benefits. It reduces obesity as well as high blood pressure. According to various studies, wholesome breakfast has also been linked to better memory and concentration. 4. Make it fun: The more you make your meal creative and exciting, the more your kid will love it. You can make smiley faces and give silly names like dino food or smiley pancakes to your food, and your kid will finish it in one go. 5. Ask your kids to cook: If your child likes getting involved in doing chores related to kitchen, they will also like to cook. You can encourage them to cook something and appreciate their effort. You can take them to the supermarket and help them pick out the veggies and fruits. If they are old enough, you can allow them to chop fruits as well. You can ask them to grate cheese, do some stirring or many small things that they could handle. 6. Be Sneaky: Sometimes, convincing kids to add green leafy vegetables on their plate could be a bit tricky, it is better to play the game of “hide and seek”. Add green chopped veggies in spaghetti sauce or mix carrots or beans in his soup. This way you can inculcate nutrition in your child without him knowing. 7. Variety is the spice: Do not stick to the same food every day. Try to include varieties. You can provide a spectrum of healthy foods for your child to pick from. You can put out lots of healthy options and ask them to choose from. 8. Do not cut back less healthy food entirely: You can not keep an eye on your child the whole day. So, you can make a schedule for your kid so that having less healthy food occasionally keeps them from becoming forbidden.